After a wet spring and a number of heavy rains there are fields with drowned crop or in some cases fields that have not been planted. Rather than let the weeds grow this offers an opportunity for soil improvement with cover crops. Wet holes or depressional areas usually will benefit from some soil improvement – typically there has been some movement of fine textured soil particles that tends to seal the area and prevent water movement. While cover crops will add more surface crop residues, well established growing cover crops will help to dry wet areas or fields. Crop residues will also start to break down faster under the canopy of a growing cover crop. In turn cover crop roots will help to stabilize the soil and improve infiltration to aid in water drainage. Do you have any nitrogen or herbicide on? What is the crop plan for fall 2015 – spring 2016? How are you going to plant the cover crop? Let’s start with the last one – how are you going to plant the crop. Is the field or area dry enough to get across yet? How much crop residue is present? There are fields with heavy drifts of residue that have floated in and concentrated in areas. Some of the unplanted acreage includes heavy clay soils with corn residue from last year – how is the best way to establish a cover crop there? Drilling in the cover crop would work best in the high residue situation but those soils are slow to dry this year. Another option is to broadcast the cover crop seed and hope there is enough moisture to get started. In that case choose cover crops that germinate fast and grow fairly aggressively so that they can get a root down into that blanket of residue. Cereal crops like oats, barley and rye generally will achieve a cover crop stand if broadcast and the weather is favourable. Do you have any nitrogen applied to the field? Even after all the rain there is still probably a good amount available for a cover crop. Generally the grasses and non legume broadleaf cover crops like radish are very good at scavenging nitrogen. Legumes will also pick up nitrogen, they are just not quite as efficient. One caution – radish and other brassicas like turnip do not do well on wet soils so may not be an appropriate choice for wet areas unless used in a mix. Note – many legumes like clover are slow to establish and may let weeds get well established, use only in mixes. Rain and wet soil conditions may have had an influence on the applied herbicides. Some may have leached lower in the soil profile while others may have degraded more due to microbial activity. Increased soil moisture does not always increase microbial activity; if the soil has been under anaerobic conditions ie waterlogged, herbicide like Treflan and Prowl will take longer to break down. 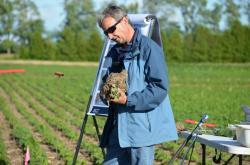 Refer to the herbicide tables below developed by Dr. Darren Robinson of the University of Guelph, Ridgetown Campus. Two important factors influence the potential for carryover injury to rotational crops: 1) how long the herbicide persists in the soil, and 2) the sensitivity of the cover crop to herbicide residues. Herbicides with shorter half-lives (the time it takes for 50% of the active ingredient to dissipate) are always less of a concern. Of course several factors influence the rate of dissipation such as rainfall, soil texture and soil pH, etc., however, most guidelines generally are for “normal” conditions (e.g. not severe drought). In general, products with a 4 month or less rotation restriction for the species of interest, close relative, or sensitive species (i.e. clovers) should pose little problem. These products typically have half-lives of less than 30 days. Species sensitivity can play a role if only a small amount of residue is necessary to cause injury and the herbicide persists. Quite often, small seeded legumes and grasses like the clovers and ryegrass and mustard species like tillage radish are very sensitive to some herbicides. The following table provides some persistence and carryover information for some commonly used corn herbicides. Some of this information is our best estimate. Table 1. Common corn herbicides, estimated half-lives, and their potential to injure fall-seeded cover crops.